On our road trip through Salta and Jujuy, I constantly felt like I was actually in the American Southwest. I've never actually been to Arizona or Utah, but I've been dying to go for years. The deep red canyons and mars landscapes have always called to me, and I was finally seeing them! In Argentina... So while I may not have made it to Death Valley in California or to the more famous Uyuni Salt Flats in Bolivia, I did finally see some Salt Flats. Argentina is making my travel dreams come true! We were staying in Tilcara with a rental car at our disposal, so we drove. Turn off of Ruta 9 onto Ruta 52, passing Purmamarca. A great way to spend a day at Salinas Grandes is to combine it with a visit to Purmamarca. The drive from Purmamarca to Salinas Grandes is just under 126 kilometers and takes a little under and an hour and a half. It includes a mountain pass with a lot of switchbacks and high altitude (pack some coca leaves or coca tea!). Compared to rougher roads we encountered later, this is a relatively easy drive. The quality of the road on Highway 52 is good. It's paved and well maintained. There aren't any restaurants or facilities. There was a man setting up a grill for homemade empanadas and tortillas. I was starving (I'm always starving) so I got a goat cheese filled tortilla (below). It was delicious! But I wouldn't rely on that, it's always possible they don't feel like going to work the day you visit. Just in case, bring lunch with you or visit early in the morning or after lunch. There is one port-a-potty that cost 5 pesos to use. It had a sign with the rules (no #2's allowed!). Not ideal but it's better than nothing. The salt flats are free to visit! In fact, the highway cuts right through them! Pull into the parking lot and step down on the salt flats for your own photo shoot, free of charge. If you're only planning on doing this, you'll probably only spend around half an hour here in total. We came to Salinas Grandes in May, in the midst of dry season (which makes up most of the year). If it hasn't been raining, you'll see something similar to what you see in these photos. It's ideal for playing on the salt and taking perspective photos. In the rainy season (January and February), the salt flats will be carrying a layer of water. This offers its own unique beauty, looking like a mirror reflecting the sky. Any photos you take will look as if you're walking in the clouds. We spent about half an hour on our own personal photo shoot. First, we posed with the giant salt cactus and salt llama, because why not! Then commenced the cliche perspective shots on the salt. Bring props and play! We had a half-empty bottle of wine that we used (also, it was for later that night at the hotel, don't drink and drive). While you don't need a tour of the salt flats, there are a couple options are at your disposal. We decided to go on a tour. We drove all the way out there, might as well see all there is to see! 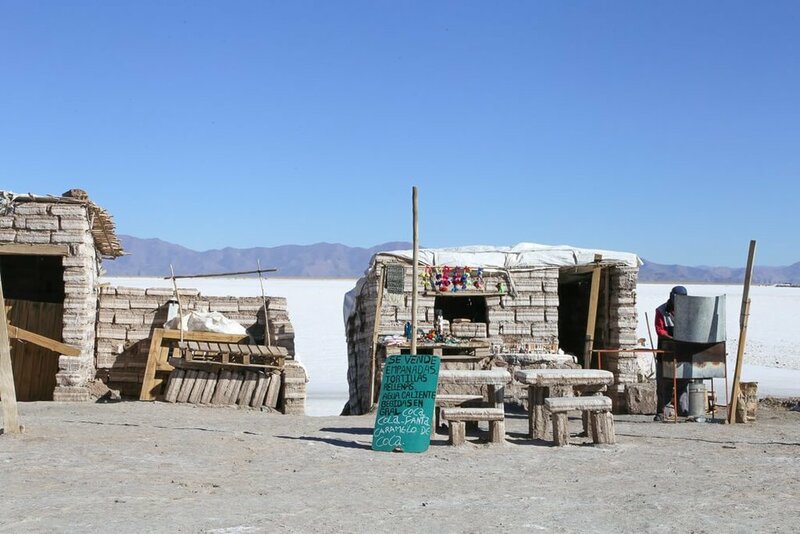 For 200 pesos (as of May 2018, around $8 US), a local guide will hop in your car with you and guide you towards the center of the salt flat. The cost is per vehicle. The tour takes 45 minutes. I'm not sure if there are English speaking guides, but it's the only way to get further onto the salar, so whether or not you understand Spanish I'd say it's worth it. Our guide explained the history of the region, the geographical formation of the salt flats and how it's currently mined. I really enjoyed it! 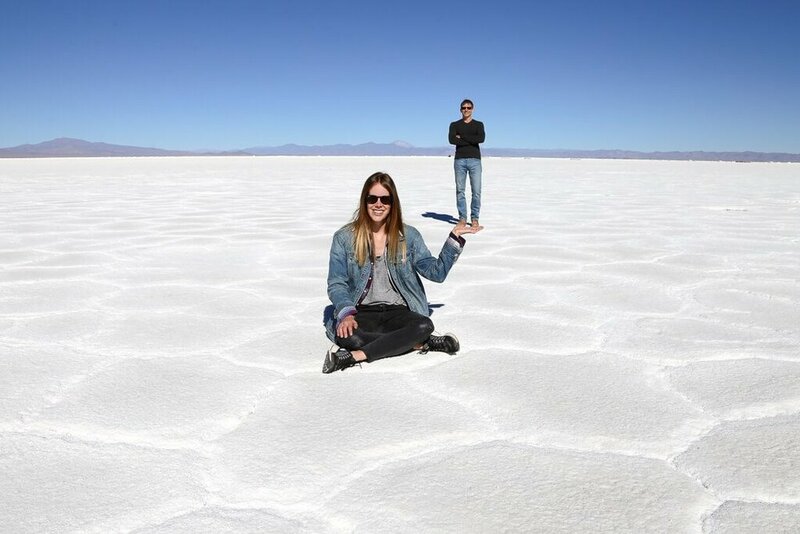 Visiting the Salt Flats is a very popular day trip from the city of Salta. We spent three days in Jujuy, but a lot of people don't have that much time to spend. It's common to come for 3-4 days, using the city of Salta as a base. 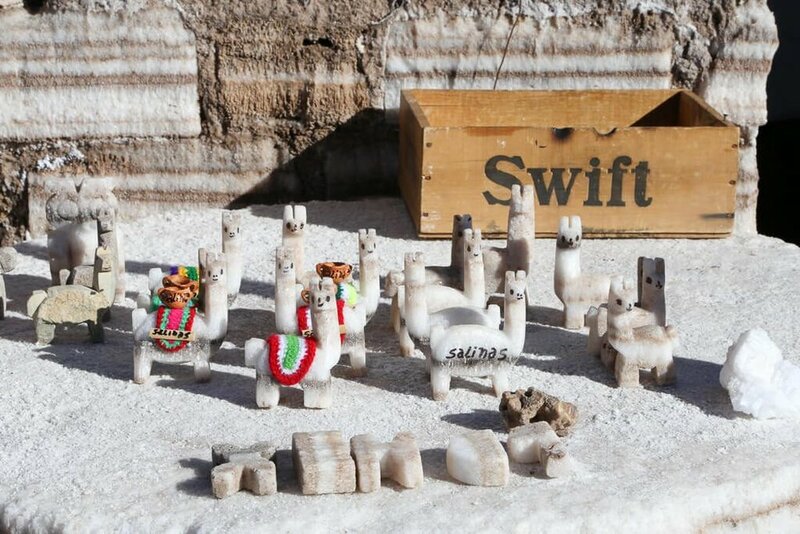 I thought I was going see llamas all over Jujuy, but we didn't see any llamas or their cousins (the vicuña or guanaco) until we were on our way to the Salt Flats. They're native to this region, the altiplano. We came across this group of dainty vicuñas when we were almost to the Salinas Grandes. So drive slowly and keep your eyes peeled, you don't want to miss them! We spent the whole morning here, you can really spend as much or as little time as you'd like! If you're looking for more to do in the region, check out my 9-day itinerary for Salta and Jujuy. 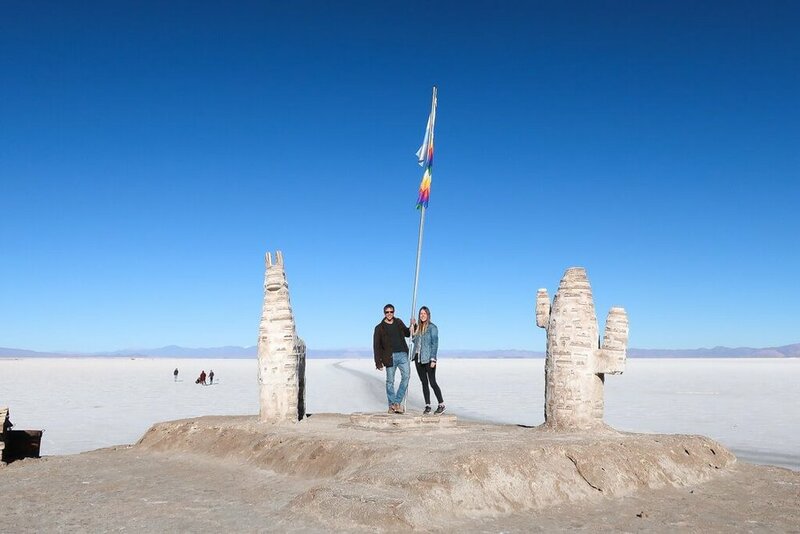 It offers a great overview of the highlights in Salta and Jujuy, as well as where to stay.